On this day in 1951, the trial of Julius and Ethel Rosenberg began in New York Southern District Federal Court. The couple was accused of conspiracy to commit espionage by providing information about the atomic bomb to the USSR during WWII. A co-defendant, Morton Sedell, also faced the same charges. Julius Rosenberg, a member of the American Communist Party at the height of the Red Scare, was fired from his government job when his political affiliation became known. David Greenglass, Ethel’s brother, was employed at Los Alamos, where the A-bomb was developed. He later testified that Julius asked him to pass along highly-classified information on atomic weaponry to the Soviets. Ethel’s role was to type up this top secret data so it could be passed over to another co-conspirator named Harry Gold, who in turn delivered it to a Soviet agent in New York. The government, and certainly the prosecution, believed that these alleged actions provided the Soviets with the necessary knowledge that led to the USSR detonating their first nuclear weapon in September 1949, sparking the Cold War. 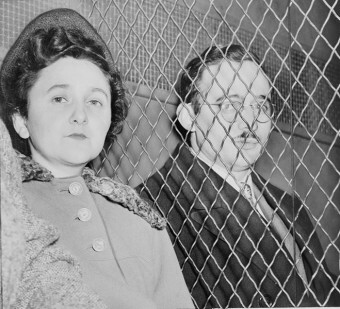 However, the only somewhat solid evidence the prosecution had against the Rosenbergs was the testimony of Greenglass. This mattered little to those caught up in the anti-Red hysteria of the day. Others believed that the only crime the coupled had committed was membership in the Communist Party. The Rosenberg trial was one of the most polarizing topics of conversation in 1951. Julius and Ethel Roseberg were found guilty on April 4, and sentenced to die in the gas chamber. They became the first United States civilians to be sentenced to death for espionage. Their co-conspirators were given lighter sentences for testifying against the couple. For two years, the Rosenbergs maintained their innocence. They appealed to the Supreme Court nine times to review their case, but the court refused to do so. Requests for clemency to President Truman, and then President Eisenhower, went unanswered. Pope Pius XII and Albert Einstein pleaded for their lives, as did millions from across the globe. Regardless, their execution was scheduled for June 19, 1953, the couple’s 14th wedding anniversary. We were told that if we cooperated with the government, our lives would be spared. By asking us to repudiate the truth of our innocence, the government admits its own doubts concerning our guilt. We will not help to purify the foul record of fraudulent conviction and a barbaric sentence…our respect for truth, conscience and human dignity are not for sale. The Rosenbergs met their deaths calm and composed. First Julius, then Ethel. There is still some dissension over what really happened, or didn’t happen, in this sad situation. But, in general, even those who believe the couple guilty (very few lay the entire blame for the Cold War on them anymore), they also feel the punishment was too harsh for the crime. Others feel their execution was government sanctioned murder- you don’t think like we do, you get executed. But, even after half a century, very few people don’t have an opinion one way or another. How Did the Cold War Start and End?